Hiking in the mountains by yourself can get dangerous, especially if you become injured and aren’t entirely familiar with the area around you. I once got lost in the desert canyons of New Mexico, and I can tell you, I wish I had a furry friend show up to guide me home. Which is exactly what one Hungarian hiker claims happened to him as he was making his way through the Swiss Alps. After spraining his ankle, he quickly lost track of where he was (something that happens when you panic or become injured). The route he had intended to hike, which was in the mountains outside of Gimmelwald, Switzerland, was blocked, and he wasn’t sure what to do next. It wasn’t long after he sustained his ankle injury that a black and white cat seemingly appeared out of nowhere and started meowing at him. So, he followed the cat, only to find out that it was leading him to safety. 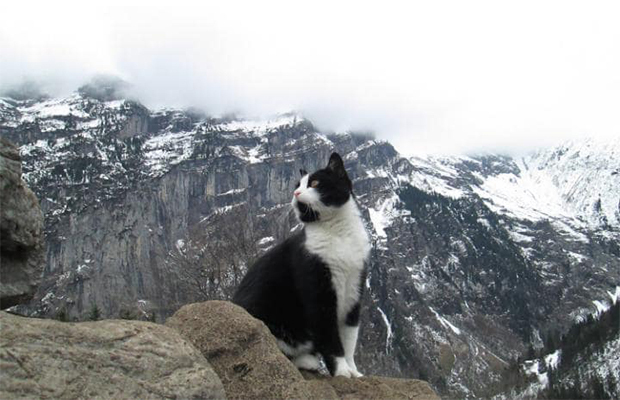 “[The cat] was just wandering around, [then] found me while I was resting from a hike,” he said. “Then she was walking and kept looking at me to follow [and] led me straight to the path that would take me back down to the valley. Located in Bernese Oberland is the small village of Gimmelwald, and it rests just outside of the Junfrau-Aletsch Unesco World Heritage Site. After the Hungarian hiker posted his experience to Reddit, many other people from around the area quickly wrote to tell the man that they’d seen the cat in their travels as well. Later in the conversation, it was discovered that the cat actually belongs to a couple who owns a hostel in the area.